The Midwest Graphite Steel Pet Gate features a strong and durable frame construction with a one-handed, safe and secure spring-loaded latch. The premium gate door swings in either direction for easy walkthrough, and is pressure-mounted with tensions for secure placement. Easy installation, both temporary or if you choose, more permanent. The price was excellent compared to other catalogs. 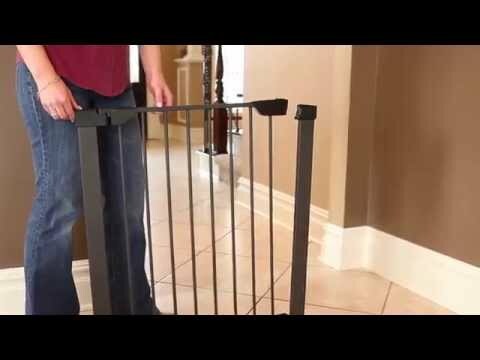 love this gate great product; I recently moved and needed a large gate (one of my dogs is adept as jumping or trying to bite gates due to severe anxiety; he's a rescue from a dog fighting ring) and this gate with its extension works so well at keeping them safe while I'm at work. We recently purchased the taller gate from Dog. It's excellent quality, so we decided to buy the shorter gate to use in our hallway. We have this gate already for a couple of other rooms. I like the quality, height, and the smaller spacing of slats since this is for small animals. If this is the quality of gate that I was looking for, the price is VERY reasonable. I will know more when it arrives, but I am optimistic. Other companies charge more. to cover opening do you have one?